Natalie Clein proves a dramatic, wholehearted interpreter of the cello version of Rebecca Clarke’s Viola Sonata. Recently Raphael Wallfisch and John York recorded it for Lyrita and not only do Clein and Christian Ihle Hadland drive through it two and a half minutes faster, they have been recorded in a much more immediate, forward acoustic, which only intensifies the vibrancy and intensity of their reading. 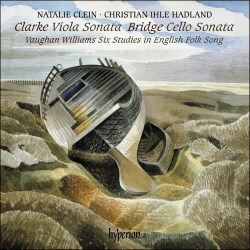 These are two very different ways of approaching a work that in recent years has become something of a viola repertory piece; the soft-grained but subtly distanced Wallfish-York, or the almost overwrought Clein-Hadland. Yet if the younger pair maintained that dangerously exciting adrenalin their performance would buckle; they don’t. Their reflective, inwardly musing passages are just as powerfully phrased and just as compelling. Legato is ardently explored, the folkloric pizzicati in the central fast movement ricocheting with great youthful panache, and in the bipartite finale – Adagio then Allegro – she vests that opening section with a lovely range of colours before unleashing renewed passion. There’s real kinship at work here, performers and work at one; the sonata positively sizzles in this performance. Note too that Clein and William Foster prepared the cello part. The earlier Bridge Hyperion disc sported Eric Ravilious cover art. The label’s design team clearly has its own sense of wit as they’ve used another Ravilious for this one. The documentation is well up to Hyperion’s high standards and I can say without any hesitation that if you’re looking for high-octane performances of this repertoire, then make the Clein-Hadland duo your first port of call.